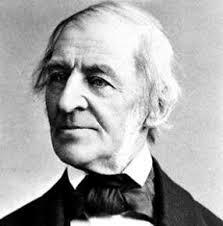 Ralph Waldo Emerson tells us in “Self-Reliance” there is “creative reading as well as creative writing.” I ask students in survey classes to respond creatively to any one work we have read over the semester. I leave the medium open, except collage, unless the student has a background in studio arts. (Make that option available and I will receive a half-dozen print-based collages, culled from magazine headlines.) Students may draw, paint, sculpt, dance, sing or snare-drum their way toward their own understanding of any literary work. From that response, I ask students to forge a paper topic. The assignment always needs some explaining. The undergraduates give the creative exercise more attention than the point allotment may deserve, and in grading, I lean as heavily on a reflection that comes with the project as the project itself. A second point of misunderstanding involves the shift from creative response to final paper. I explain to students that they need to forget the painting or drawing or song, and in the end, focus on the idea they were trying to convey. But the final results are invariably worth the trouble. Student papers often cross a professor’s desk at a time in the semester when energies are flagging, yet the essays forged from the initial creative spark come back fully inhabited. I love the minor key of the melody, the grunge-like drone, the doubled vocals and ambient howling. I have to confess, I needed Jasmine to send me the lyrics (below). The teacher in me does not care. Jasmine turned in a stellar final essay. Actually everything she did in this class was stellar. She sat to the side, next to her longboard. Some times I thought she was drifting off, but whenever I asked her a question, she came back. Spot on. In class sometimes we compared song-writing and prose composition. She offered genuine insight. The main difference, with songs, is you work with a band. That’s a second point I hit with the surveys. Think in community. Create as a band.